Proceedings of the Fifth Vertebrate Pest Conference, (VPC-1972) Published at the University of California, Davis, May, 1972. 204 pp. 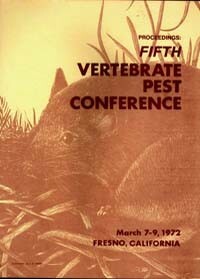 Description: Proceedings of the 5th Vertebrate Pest Conference March 7-9 1972 Fresno, CA, arranged by the Vertebrate Pest Council of the Vertebrate Pest Conference Editor Rex E. Marsh. Description: Barrier Fencing in Wildlife Management, Related Laws on Exotic and Native Wild Animals and Starling Control in Sanoma County.